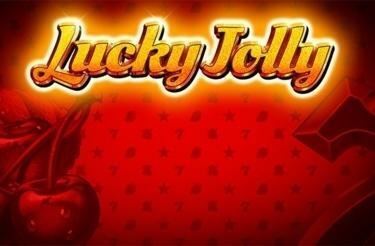 Play Lucky Jolly online for free now! A big performance for the Harlequin! Has the jester hidden the jackpot under his bell hat? Well, he is not going to part with the cash that easily! To pry the treasure out of the jolly jokers hand you need 4 of his brothers by his side on one of the win lines. Once the Harlequin family is complete they shower you with Twists in the guise of the Lucky-Jolly-Jackpot! Winning is easy in Lucky Jolly: 5 matching symbols on one of the 10 lines and the Twists are yours. There is just one requirement: The lines running from left to right cannot be interrupted by symbols, which are not part of the winning combo. 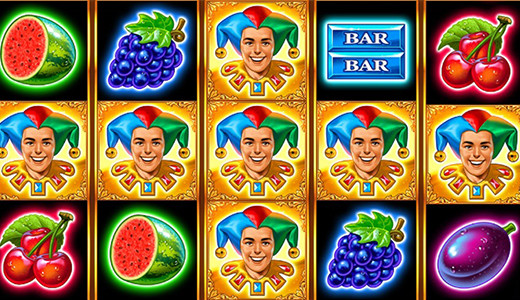 The joker is your little helper when it comes to winning - he's got 2 jobs: He substitutes for any symbol as the Wild symbol in the game and he cracks the jackpot for you if he lands 5 times on one of the win lines. At least 3 Stars (Scatter) anywhere on the reels trigger 5 free games with Jolly-Chance-Bonus-Feature! At least 3 Scatter (Stars) trigger 5 free games with Jolly-Chance-Bonus-Feature, which carry the settings of the regular game. The Bonus Feature increases your winning odds: During the free games only Joker symbols appear on the 3rd reel! Land 5 Joker symbols on one of the win lines and you crack the progressive jackpot! If you place the maximum stake you get 100% of the jackpot. Lower stakes get you a share of the jackpot.